Red Headed Femme: "When the rich wage war, it's the poor who die"
This is a must-read op-ed at Bloomberg, written by a man who founded many companies and last year raked in an eight-figure income (on which he only paid 11% in taxes). I think he knows whereof he speaks. Even so, I’ve never been a “job creator.” I can start a business based on a great idea, and initially hire dozens or hundreds of people. But if no one can afford to buy what I have to sell, my business will soon fail and all those jobs will evaporate. I don't know why Mitch McConnell and his merry band of Nazguls in Congress continue to cling to this ridiculous myth. I suppose it's all of a piece with their sticking to their story of trickle-down economics and denying climate change. They're so terrified that their patently false way of life might have to change that they'll hang on to it to the bitter end, irregardless of common sense or facts. It is mathematically impossible to invest enough in our economy and our country to sustain the middle class (our customers) without taxing the top 1 percent at reasonable levels again. Shifting the burden from the 99 percent to the 1 percent is the surest and best way to get our consumer-based economy rolling again. Significant tax increases on the about $1.5 trillion in collective income of those of us in the top 1 percent could create hundreds of billions of dollars to invest in our economy, rather than letting it pile up in a few bank accounts like a huge clot in our nation’s economic circulatory system. No matter how much you jump up and down and throw a hissy fit, math is still math. Remember the 1950's? That wondrous decade all these traditional types look back on as the nadir of American society (at least for white Christian males)? 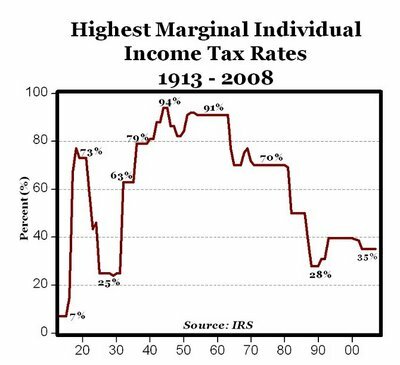 What were the tax rates then, pray tell? Admittedly these are marginal tax rates. The actual tax rate paid, with loopholes and deductions and such, was probably around 50%. Nevertheless, the country didn't crash and burn, now did it? With the way the Republican Nazguls are screaming, you'd think President Obama is wielding the One Ring and dragging them back to Mount Doom. In the land of Socialists where the Kenyans lie. (back to article) So let’s give a break to the true job creators. Let’s tax the rich like we once did and use that money to spur growth by putting purchasing power back in the hands of the middle class. And let’s remember that capitalists without customers are out of business. And capitalism without proper taxation is the country we have today--a godawful, unequal, top-heavy mess.